The lost art of bedroom choreography is flung out of the wardrobe and up to the Edinburgh Fringe with gusto. May-We-Go-Round? cycles through a 60 minute excavation of past loves and exorcises them in the style of Taylor Swift. We meet Ian, Elliott (with a double t), Luke, the fit PE teacher, and oodles more as Chess Dillon-Reams and Cristina MacKerron narrate each other’s temporary heartbreak via shared direct address, full sass choreography and bedroom dance routines. The face is where we as humans connect with each other; we don’t look at the suppleness of the spine or a hyper-extended leg to feel closer to a performer; we can admire it but it inevitably distances us. Chess’s and Cristina’s faces are things of elastic wonder; eyebrows on the go slow, tightly mouthed squeals of delight or throwing us two barrels of side eye — they perform with their whole bodies and we drink them in entirely. There’s a real guts and guns approach to the quality of movement — a throw-your-body-on-the-line-and-leave-nothing-behind — and this spirit engenders a forgiveness for any lack of technically sound unison, unfinished moves or broken lines. May-We-Go-Round? acts as a connector to our own histories, a show with two performers we can relate to and it triggers memories of Dreamphone, Now 42 and Smash Hits. The Hiccup Project have cleverly tapped into a 90s nostalgia kick and it disarms the normally reserved contemporary dance audience. Their audio bibliography is clear (Spice Girls, Craig David and Cher) and how they describe and execute their work (not a mention of the word dance in the description) resonates with the majority of the under-35, female audience who were having a noticeably good time. Chess and Cristina are full of empathy and it’s impossible not to like them. Their relationship and familiarity with each other is clear and strong; the work is embedded in their bodies allowing their performance to shine through in the detail. Working with Antonia Grove and Lou Cope on the dramaturgy has resulted in a tightly-woven and well-constructed work. In the sections between the narration and movement they break the fourth wall and gift the audience a generous quadruple vodka and a dash of cranberry or explain the reasoning behind Chess’s excessively red face. These sections aren’t gimmicky but fit the tone, mood and enhance the connection between performers and audience. 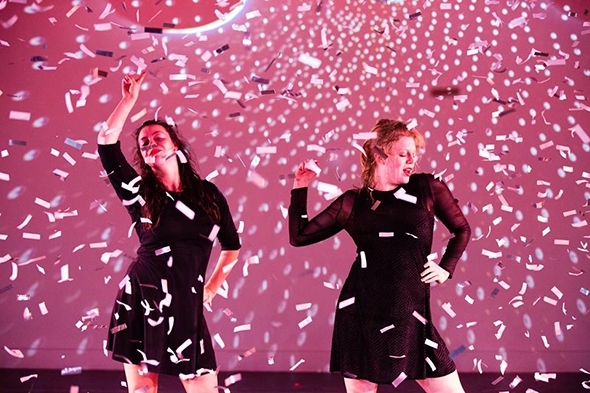 There’s a growing crop of independent female choreographic voices that are excavating their own past and using comedy intelligently to bring audiences towards them: Sarah Blanc, Justine Reeve, Skye Reynolds, and Rhiannon Faith. The Hiccup Project’s choreographic candyfloss can be added to that list. I look forward to Now That’s What I Call The Hiccup Project 2.